Butternut squash and kale are back. Add some fresh mushrooms and fresh extra virgin olive oil and you have a healthy, seasonal meal that tastes great. If you wish, you may substitute the Family Reserve EVOO with another robust EVOO such as Coratina or Picholine. Amazing! Preheat oven to 350 F. Place Butternut Squash in a baking dish with 3 Tbps. of Mushroom Sage Infused Olive Oil, 2 fresh sliced sage leaves, season with Garlic Salt and place in oven for 10 minutes or until cooked through. In a large skillet heat 3 Tbsp. of Family Reserve EVOO over medium-high heat until it simmers then add garlic and shallot, 4 whole leaves of sage and saute for 2 minutes, add mushrooms and saute for 1 minute longer. Finally, add sausage and cook until browned, about 5 minutes. Add a pinch of Garlic Salt. Meanwhile, blanch kale in a pot of well-salted boiling water, uncovered, 5 minutes. Drain kale and add to sausage in the skillet and saute, stirring frequently, until tender, about 5 minutes. Cook pasta following package directions. When pasta is done reserve 1 cup of pasta cooking water. Add the pasta cooking water (1 cup) to the sausage skillet, stirring and scraping up any brown bits from the bottom of the skillet. Drain pasta and add to sausage skillet, tossing until combined. 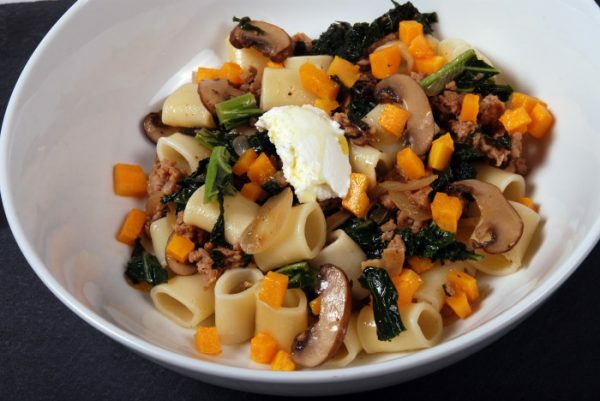 Serve pasta in bowls and finish with butternut squash, sliced sage and a Tbsp. of ricotta cheese.